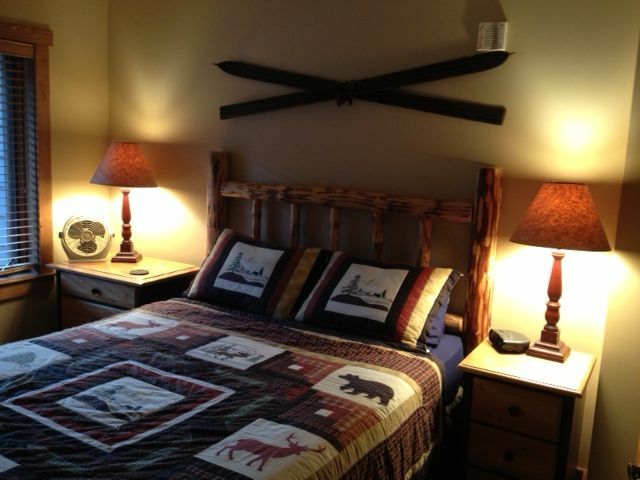 Welcome to our luxurious Red Hawk Lodge condo located in Keystone’s prestigous River Run Village! You are within easy walking distance (~120 yards) to the Gondola,Ski lifts and Village. This means you dont have to drive anywere or pay for parking or wait for shuttles. You dont even have to walk down any long hallways or wait for elevators as this is a walk out unit that is very close to the lift. This is a Great Location! Ski all day, come back to condo for lunch, enjoy a dip in the hot tubs or heated pool. Keystone also boasts incredible night skiing with the fully enclosed gondola lift great for warming up between runs. Keystone owns the 'NIGHT'. Redhawk lodge is quiet, yet just steps away from the action/ excitement of River Run! We offer to our guests, while they last, discount coupons for lift tickets. Book your stay with us! We will match the rental rate of any other comparably sized and quality & location of units in the area. Our well-appointed one bedroom condo sleeps 2 to 4 comfortably with one queen size bed and one queen sleeper sofa. You will find all comforts of home including a fully equipt kitchen with every necessity, large soaking tub, mossy rock fireplace and the patio with chairs will make your stay a real pleasure and extremely relaxing.... Shopping, live music, art galleries, restaurants, pubs, coffee shops & cyber café (in the Village) are just short steps away. Outlet shopping stores just ten minutes away! The Lodge has fantastic amenities! You can relax in the heated outdoor pool and hot tubs, which look to the wetlands & mountains with unobstructed views. Enjoy using the Spa with a Steam room, treadmills, eliptical and weight machines! In RH’s large lobby you will find a large stone fireplace and pool table, & large screen TV & a leather sofa for a cozy gathering. A heated under-ground parking garage is provided for your convenience. We are the closest lodge to A-Basin. (7-miles) As well as being just a short drive to Breckenridge, Copper Mountain, Vail ski areas and access to year-round mountain and resort activities! There is also a free resort shuttle service, if needed. I stayed here with my 3 kids and the location was prime for the River Run Gondola. We were able to walk back mid-day for lunch and a rest. The building had an outdoor heated pool and hot tub and the ski lockers were very convenient. The owner was very helpful and responsive! The room was a good size and decorated nicely. The only reason I didn't do a 5 is because the fold-out bed was not the best. For one it would be great, but it sagged in the middle and my kids were rolling towards the middle on top of each other all night. We would still stay here for the location and other amenities though! Nice location close to the gondola and the owner is very helpful and nice to work with. Great place for a quick getaway. Very close to the Gondola. property well appointed, equiped, and location to gondola excellant. owner quite cooperative and very reachable. we were also able to utilize the common area for a gathering with extended family who were staying in condos on the south side. Good location and clean. I would stay there again. We enjoyed our stay, and would come back any time. Great location, well-kept unit, friendly owner.